LOS ANGELES (AP) — Nearly a quarter of the way into their season, Danilo Gallinari and the Los Angeles Clippers are the surprise leaders in the Western Conference. Los Angeles improved to 14-6, which ties the fourth-best record after 20 games in franchise history. Along with being the surprise leaders in the West, the Clippers own the NBA’s longest active home winning streak and have won 10 of their last 12 overall. “The third quarter was brutal. We couldn’t find the rhythm and the stops. 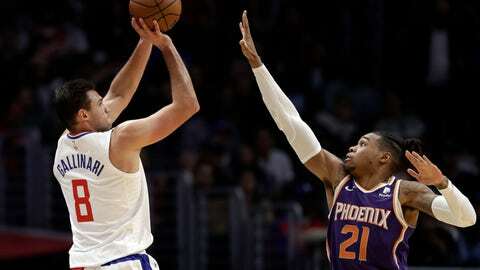 We were taking individual action, which isn’t the way to win,” Suns coach Igor Kokoskov said. Suns: T.J. Warren and Josh Jackson each scored 15. … Ayton, the top pick in this year’s NBA draft, had a season-low four points but led the team in rebounds with nine. … Richaun Holmes came off the bench to score 10 points. … This was the first time in five games Phoenix did not have the lead going into the fourth quarter. … The Suns are 0-2 in the second game of back-to-backs. … G Isaiah Canaan was waived. He appeared in 19 games and averaged 7.5 points and 3.3 assists. Kokoskov said it “was a business decision but I feel good about his future.” Canaan began the season as the team’s starting point guard before Kokoskov moved Booker to the point and inserted rookie Mikal Bridges into the starting lineup. Clippers: Montrezl Harrell scored 13 of his 18 points in the second half. … Shai Gilgeous-Alexander had 13 points. … Los Angeles has won nine straight against the Suns, dating to the start of the 2016-17 season. It is the club’s second-longest active winning streak against a single opponent — the Clippers have won 10 in a row vs. Orlando. … F Marcin Gortat did not play due to back spasms. … F Luc Mbah a Moute (sore left knee) and G Jerome Robinson (strained right foot) were inactive.